So you don't like Guy Lombardo? Kick Axe, a Canadian rock 'n roll band will be performing in Lethbridge New Year's Eve. Tickets to the 8 p.m. concert at the Exhibition Pavilion are $14.50 today - with 50 cents from each ticket to be donated to the United Way. Victor Langen, bass guitarist and vocalist, said in an interview the Lethbridge concert is the band's first since a nine-day break over Christmas - but the group isn't always able to get home to Winnipeg for the holidays. "I've had turkey dinner in Denny's on Christmas Eve - that was last year in Calgary," he says. And bands can forget about relaxing New Year's Eve. Few bands in the country aren't working Dec. 31. Kick Axe isn't new to Lethbridge. "We've been coming here since we started (over six years ago)," he says. "We've played at the (Lethbridge Community) College and the Alec Arms." Along with Kick Axe is the group White Wolf. Kick Axe recently released its second album - Welcome to the Club. Brian Gillstrom, drummer, says the album shows growth and maturity over their first release - Vices. Kick Axe has opened for such bands as Judas Priest, Quiet Riot, Whitesnake and Krokus. 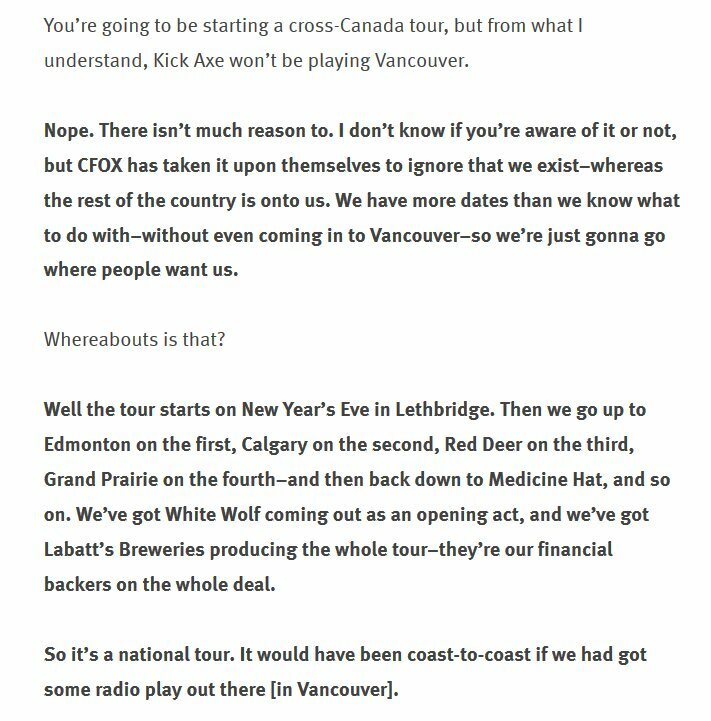 After the New Year's Eve concert in Lethbridge, Kick Axe will head to Edmonton, Calgary, Red Deer, two concerts in Saskatoon, concerts in Manitoba and Ontario and Quebec. Langen says in some ways the band has had an easier time in Central and Eastern Canada because by the time it toured there, it had already recorded an album. He says in Western Canada the band has already established a reputation as a bar band. Tickets for the Lethbridge concert can be purchased at Anglo Soundsaround, or at the door.